Apple Inc. and Google Inc. have publicly fought each other over patents, privacy protections and the attention of app-makers. But they’ve also colluded in the past to not poach each others’ workers, shared revenue from Google searches on iPhones, and agreed to fight the FBI over demands to weaken smartphone security. Now, the two Silicon Valley companies have found a new place to get along: the cloud. In recent months, Apple has begun placing some users’ iCloud data, including backed-up photos and messages, in online storage operated by Google, according to a person familiar with the matter but not allowed to speak publicly about the deal. Trade publication CRN first reported on the shift Wednesday. It’s surprising at first glance that Apple Chief Executive Tim Cook would trust his users’ iCloud accounts to a company whose business model he has indirectly described as “wrong” because it involves “gobbling up” customer data to serve them relevant ads. But Apple desperately needs storage space as it works to develop its own cloud capacity. 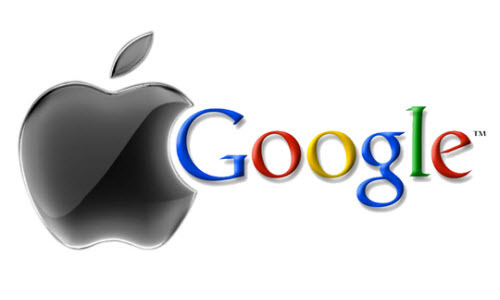 By turning to Google, Apple won’t face any new security risks, analysts said. Google will generate revenue in the deal, but it won’t be able to mine any Apple customers’ data. Amazon.com Inc. and Microsoft Corp. are the global leaders in cloud computing, which allows other companies to buy access to a network of computers to store data as needed without having to manage the expansive infrastructure themselves. Apple has said it’s a customer of both Amazon and Microsoft. Google, which has been a distant competitor in cloud computing, has been aggressively pricing its service to attract big-name customers. It recently signed music-streaming app Spotify and counts Venice chat app start-up Snapchat as a longtime customer. But taking over a portion of Apple’s needs appears to be its biggest deal yet, experts have said. It’s unclear whether Apple signed with Google because it wants to push for lower prices from all of its cloud providers, to safeguard itself against outages on a single vendor, or to use some specific tools Google offers, said Dave Bartoletti, principal analyst at consulting firm Forrester Research. Whatever the mix of reasons, the basic set-up with any cloud provider is the same, according to Apple. Data stored with another company is encrypted, or scrambled using a digital lock, Apple says. And it doesn’t share the key with the other companies. That means law enforcement seeking someone’s iCloud data would still need to ask Apple for help, rather than the storage provider. Apple is reportedly working to create technology in which it would not have a key at all, giving users’ sole control to unscramble encrypted data. How to Restore iPhone 6s Photos Deleted By Restoring from iCloud Backup? This entry was posted in Apple, iCloud, News and tagged apple, google, icloud storage by IosdroneD. Bookmark the permalink.